Today’s guest writer, Patricia Iles, is one of the newest members of Studio30 Plus. After reading a piece she submitted to the S30P Community Blog, and reading her writing at Contemplating Happiness, I knew I wanted to invite Patricia to write for Naked Girl in a Dress. She has a beautiful outlook on life with a talent to write. After you have read Patricia’s guest post here, please visit her blog and follow her on S30P. Patricia is a wonderful new-to-me writer that I can wait to read more from in the future. I bet you will agree. A friend once told me that aging was a little like a gag gift. In some ways she was so very right. I admit I’m not amused by the increasing frequency of crazy chin hairs. I’m not amused by an aging bladder. I’ll never be guilty of texting while driving because I can’t read something that small without glasses. But the gag gift has a lottery ticket hidden inside. The years have given much more than they have taken from me. Age has given me a clearer vision than even my prescription glasses can. When I was 20, I thought 48 would find me old and gray and retired. I couldn’t have been more wrong. I think we come into our real beauty after 40. Not because we look so much better, necessarily, although I’m certainly cuter than ever. I bet you are, too. I think it’s because we finally begin to wear the rough edges smooth. We (hopefully) learn that the shell is only a tiny fraction of the totality of being a woman. I certainly work harder, and smarter, than I did back then. It’s true that I don’t have the energy I once did, but that doesn’t matter because I’ve become a much better steward of my energy supply. I still have a huge struggle with wanting everyone to do things the way I want them done. You would think that by now, people would see the wisdom of doing things my way, but it still isn’t happening. Huh. Those years taught me to stop trying to measure my marriage by someone else’s yardstick. It doesn’t matter that Dad rubbed Mom’s feet, or that he never so much as got himself a drink of water, without asking Mom if she wanted anything, while he was up. True, my marriage doesn’t look anything like theirs. It’s also true that their marriage was a stellar success and anyone would do well to learn from it. That doesn’t mean I should expect a carbon-copy. Wow. That cliché just showed my age, didn’t it? Who ever heard of carbon paper, anyway? I had to learn that my husband would have his own ways of showing his love and it would be up to me to learn them. I also had to learn that my demonstrations of love would need to be something important to him, and not what I wanted to receive. The years also taught me to stop trying to measure myself by that same faulty yardstick. The things that made me feel so ….different …in my youth are the things I have learned to embrace in my middle years. My curiosity and inquisitiveness have become useful tools in my arsenal instead of something that made others get tired of answering my questions. The wordy girl who won spelling bees went from being snickered at, to being called “the spelling police”, to being the go-to girl when someone is composing a letter. Maybe that is a small milestone, but it’s an important one. Most important of all, I suppose, is that the years have given me a more realistic assessment of my flaws. I finally figured out that the oily skin that frustrated me so much once, is the reason I don’t have any crow’s feet. When you’re nearly fifty and your skin shines like a teenager on French fries, people mistake you for younger than you are. The occasional zit helps that illusion, too. The bump on my nose and my ugly feet don’t bother me at all anymore. Now I’m more troubled by my opinionated mouth and my genuine talent for procrastination. Once, I wished I was prettier, taller and had thick hair. Now I want to be braver and to perfect my balance in life. Maybe getting older really is a gag gift. That might not be so bad. Someone gave me a bottle of gag “Old Age Pills” on my fortieth birthday. And they were really licorice jelly beans. What’s so bad about that? I’m fortunate. My parents looked much younger than their ages til a few years ago. They’re in their early 60s now. I saw a picture of my high school graduation. My mom was 37, my dad was 39, so a touch younger than what I am now. They looked maybe 30, tops. I feel older than what I am and I think I look it. everyone else tells me differently. I think as long as you’re healthy and happy (whatever that means) then you’re gold. honestly, when I met you a couple of years ago, I thought you looked younger, too. I think we look more beautiful when we are happy–it radiates, we smile more, etc. I am so happy to have you here, Patricia! As I get closer to another birthday where I will will move from a 7 to an 8 in a decade unfathomable to me, I can’t agree with you more. The next big decade looms way too close, but hell there’s nothing I can do about it. I can only look back, laugh, spit on the ground for luck and embrace what is to come. I know some of my edges are smoother, though the area of patience is not one of them. As I get older, I plan to be one of those tough old broads who says what she thinks and has no time to suffer fools. I plan to laugh..a lot. I plan to continually push my comfort level and try new things. I plan to keep rockin’ til they take my dancin’ boots away and I plan to look back at the end and be thankful for the ride. Will there be wrinkles and saggy upper arms? You betcha…and a whole lot of laugh lines. Thanks for stating the obvious…we are all beautiful. As the exterior fades, the interior shines. kath galasso recently posted..Could You Do This Job? I think, in part, a measure of success in life will be the number of laugh lines we earn. Life is better in our 40’s. I promise! 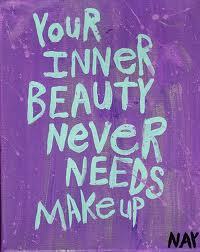 “Your inner beauty needs no make up” – how inspirational!! Like the quote from my heart. Inner beauty is the best part of a human being, it describes a person. The beauty we take care almost everyday becomes fade day by day. But it is the internal part which grows and shines day by day. It helps to develop as a human being. Wonderful 7 motivational writing for sure. Best wishes!! Thanks for visiting, Sophia! I am so happy Patricia’s piece resonated for you. She is a wonderful writer. So very true – Now that I’m in my late forties I can relate to everything. Wasn’t this a wonderful guest piece? I am so appreciative she shared her words here.